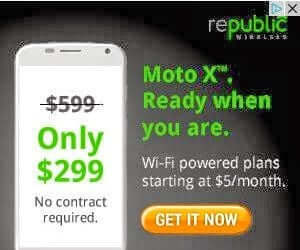 $299 and as little as $5/month-NO Contract. 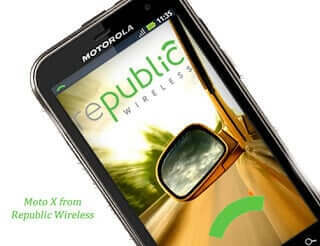 Republic Wireless is clearly different from all of the other mobile phone companies that I am aware of. 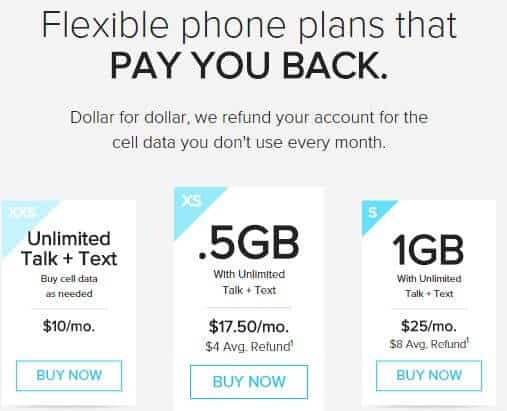 They are very upfront about the way they operate and you know exactly what you will be paying for your mobile phone service month after month (and it is a bargain). More details about each phone are below. By the way, buying your phone outright might seem risky, but believe me, if you currently go for two year contracts with AT&T, Verizon or Sprint, you will ultimately pay much more for that same exact phone. Furthermore, most places that are selling these phones off-contract sell it for at least $100 more–so this is a good deal for the Moto phones. They give you a one month trial period, but after that month, the phone will be yours to keep, even if you don’t continue with the service. 1) $10/Month Level – You get unlimited talk and texting, but you only get data when you are on wiFi. I love this level. This is great for people who aren’t likely to use data, especially when they’re out in the field. This might be really good for someone in college who lives on a campus that has blanket wi-fi. So long as their on campus they have full use of the voice, texting and data…but once they leave, they can only use the phone. You’ll definitely be amazed at just how much you can get done on your phone using just wiFi, but if you go away from your wiFi service, you’ll be disconnected–you won’t be able to make any phone calls or do anything with data, including the use of many data-hungry apps. So if you travel outside your home, office or campus with the phone it won’t be of much use. 2) $17.50/Month Level – For $17.50/month you’ll get unlimited talk, text and a half a gig of data, The data will be available at 4G/lte speeds. If you aren’t familiar with 4G, it is fast enough for most people, but definitely not WiFi fast. This is likely to be one of the most popular choices though, this is the one I would advise most people to go for. You can always upgrade to a higher plan (or downgrade) at will, with no penalties. Half a gig would be easy to use, but again, especially if you are someone who is always near WiFi hot-spots, you may not even need that much. 4) $40/Month Level – You get unlimited talk, texting and 2 gigs of mobile data, and the data will be at 4G speeds where available. This is a very good deal. 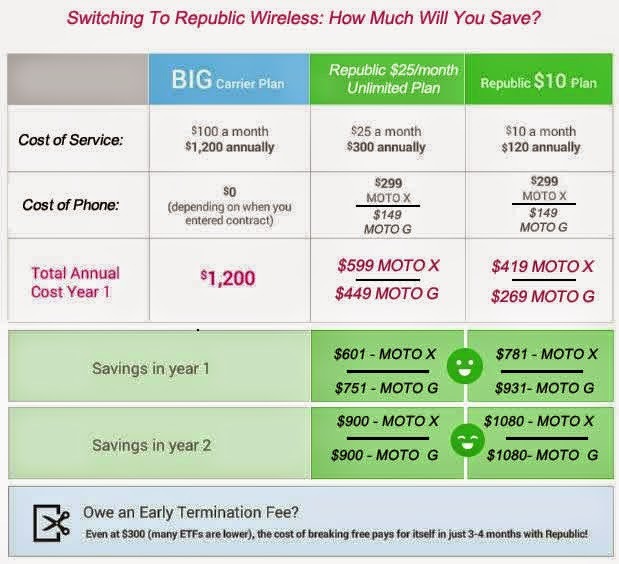 Note about taxes and fees added to your bill each month: Republic Wireless does add the required fees to your monthly bill. So for example in my case, I pay about $3.49 extra over the $25/month plan for fees — so my monthly bill is more like $28.49. The fees are definitely annoying but not avoidable (and much worse if you go with AT&T or Verizon). Example fees and taxes are: Universal Service Fee $0.09, E911 County/State $0.50, FCC Regulatory Fee 0.01 cent, etc. I am not sure which of these fees would still apply if you went with the WiFi only level. All four of the above-mentioned levels provide a very important feature that’s central to the use of your Republic Wireless phone–you can use your phone over a wiFi connection. This includes voice, texting and of course data. Most of the time, this is going to give you the best connection experience and in many cases, where a signal isn’t available you’ll be the only one with a connection. For example if you work in a basement or area with no cell service, but do have a wiFi connection available, you’ll have strong/clear service. In our case, our home is on the outskirts of service for all the major providers so we are thrilled that have the option to get service over WiFi–and we can make calls and even send SMS/MMS messages over WiFi (that’s huge!). Another great example is if you go overseas, you can take your phone and make/receive calls when you’re connected to WiFi…with no roaming or extra charges. Republic Wireless generally uses the Sprint network for its voice and data services. Unlike other MVNO (independent) wireless providers, Republic Wireless allows you to roam (for free) when no Sprint service is available. This is transparent to the end user, but it is also an important feature. You should be aware that you will not be able to roam internationally with your phone — generally CDMA phones (the kind that Republic Wireless uses) do not work outside of the USA and Canada–on the other hand, you can use your phone for calls and texting from a wiFi connection anywhere in the world–potentially saving yourself huge amounts of money when compared to international roaming through AT&T and Verizon. All levels of service include visual voice mail. Republic’s voice mail is about what you’d expect it to be. I really love the fact that the Moto X can make calls and send text messages through Wifi. This solves a huge problem for many folks–If you don’t have a strong signal for making calls, etc, near your house or office, hybrid wifi calling is the solution. Republic Wireless has developed a wonderful system whereby if you are near your WiFi, it will make calls and utilize it for data and texting. If you are away, it will use the Sprint network to do the same. Better yet, you can start a call on WiFi or the cellular network and it will automatically switch over to the other when needed. So if you were at home when you placed a call to your friend and then left for an appointment, the call would continue and it would magically be handed over to the Sprint network as you get further away. You can even use WiFi to send MMS messages (text messages with photo attachments for example)–in my case this is a quick and effective alternative to using distant cell towers to do the same. You can also change your phone number right from the app. It isn’t something you could really do by accident because you do have to provide your username and password, but it is still very easy to do. As far as phone number changes, you are allowed to change your number twice for free. After that, you’ll be billed $10 for each time you change your number. Also, you can only select the area code and first three digits, Republic Wireless selects the last 4 digits for you. 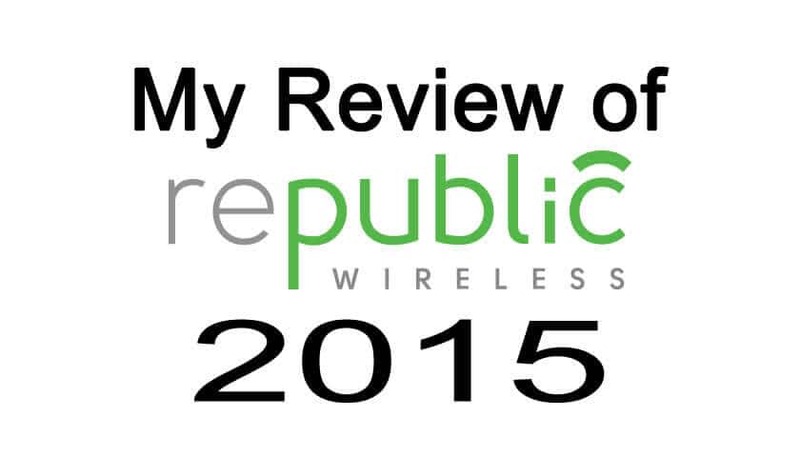 Republic Wireless consistently gets high ratings from many sources. 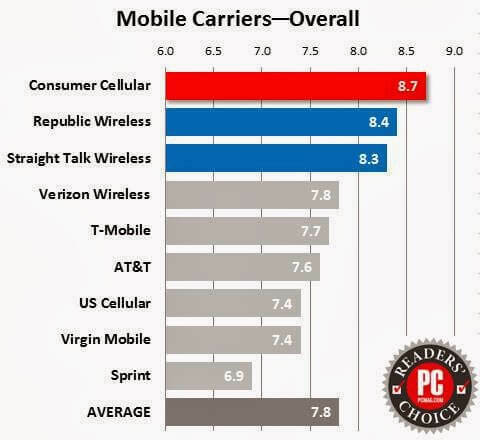 Most recently, PC Magazine Reader’s Choice Awards 2014 rated it the second best carrier in the USA. With the transparency and lack of hidden fees that plague the other carries, this is a no brainer. Republic Wireless tech support is generally pretty good. Your best bet for fast service is just to post to the community forums. 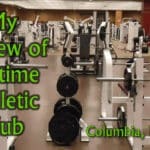 They also offer support by email and twitter (and snail mail, if you can imagine that–I am trying to think of a tech support problem I could snail mail about–would love to gauge that response time). What they don’t have is a call center–that is you can’t call to discuss your tech support issues. This is one way that the company saves money. Although this is inconvenient, most questions have already been answered in the searchable support forums…and like I said they’re pretty responsive via electronic means. You should not take the lack of a call center to mean that they don’t have dedicated people working on support, apparently they do–and they have people answering questions 7 days/week from 8am-11pm EST–you just can’t call them. According to their data, their customer satisfaction is over 90%. Whichever wireless plan you choose, you’ll need to provide a debit or credit card for billing. 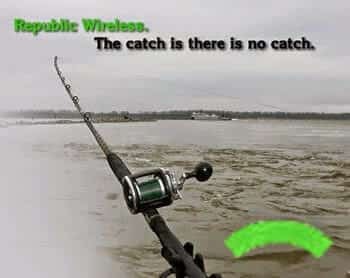 Republic Wireless charges you monthly. Again, I am very comfortable with this as there are no possibilities for surprise charges. You are billed for the plan you choose plus any applicable taxes and fees. Once you’ve seen your first month’s bill, you have pretty much seen them all until you change your level of service. This is a wonderful phone. It is one of the most popular Android phones and uses the Kit Kat 4.4 version of the operating system. It comes with 16 gigs of memory and is not expandable. It has a crisp, beautiful 5.2 inch display-that’s a bit larger than most phones. Battery life is said to be about 24 hours of “mixed use”, but this depends on how you use the phone–still it is definitely going last longer than your average 2015 mobile phone. My experience has been that the phone definitely lasts me all day with battery to spare, and that includes emailing texting, calling and some photos. There is a very fast 13 megapixel rear camera and a 2 megapixel forward facing camera for video conferencing (ie-Skype or Google Hangouts–something you’ll be able to do on the go, since you won’t have to worry about using too much data!). The phone is filled with convenient features, such as the ability to easily use the Google Now features–it is always listening for you to issue commands to google. For example you could say “Google, do I need my umbrella today?” and it will respond with a useful, accurate answer verbally “No, there is no rain in the forecast for New York City today” (or wherever you are). The camera is easy to operate and is quick on the draw. To use the camera on the phone, you can go through the android menus or you can just wiggle the phone back and forth and the camera opens up. To take a picture you can just push anywhere on the screen–and if you hold down your finger it will continuously snap photo after photo. Video mode is also quick and easy–it even lets you take photos while you’re taking a video–a feature that is handier than you’d think. By the way, if you take lots of photos like I do, you’ll want to add the Google+ app to the phone–it will automatically backup all of your pictures to your google+ account and can even search them using computer vision (ie-you can ask it to find pictures of beaches, or sunglasses or even someone wearing sunglasses on the beach!). This phone is very quick and responsive and it works very well with popular apps. The Moto X generation 2 is one of the go-to phones that developers would use to benchmark their Android apps. Also, in case you were wondering, the GPS syncs up quickly–so it is there when you need it for navigation with the standard Android built-in Navigator or with my favorite social navigator “Waze“. The Moto G isn’t quite as powerful as the Moto X, but it is still a good, respectable phone. I do not own this phone myself, so my experience with it is limited, but most people who do have it seem to be pretty happy. The biggest points of comparison between the two phones are the processor, memory (the Moto G generally has less) and the camera quality. The processor is not as good in the Moto G, but the difference doesn’t seem to be that noticeable. As far as the camera, well, it isn’t as good. The Moto X has a 10 megapixel rear-facing camera while the Moto G’s is only 5 megapixel. This is still a relatively good camera compared to other phone models out there, but still this is a consideration. You should also note that the screen size is very slightly smaller in the Moto G and it isn’t AMOLEd. Still even with these differences, the cost of the Moto G is just $99, and that’s really unbeatable. Just like the Moto X, there is now a second generation version of the Moto E. The phone costs $129 and comes with 8 gigs of memory. Unlike the Moto G, it is expandable up to 32 gigs with a micro SD card–a big advantage. It has front and rear facing cameras with the tap to focus feature. The rear facing camera is 5 megapixel. The phone has the 5.1 version of Android Lollipop. The screen size is a venerable 4.5 inch qHD screen. Battery life is rated at 24 hours, but I wouldn’t expect to get that much out of the phone if you put it to more than mild use. This phone is a not bad for the price and seems to be generally well liked in the marketplace reviews. The Moto X, Moto E and Moto G are slick looking mobile phones. If you’re worried about protecting yours there are some very nice cases, screen protectors, car dash mounts and other useful things to enhance your experience with your phone. Since these phones are so standard, you can get accessories for them from a variety of places including from Amazon.com or directly from the Wireless Republic store. – One of the most popular cases you can get for your Moto phone is the Otter Box brand. These are premium cases that come at a relatively higher price (about $40) but most say they are very reliable and well made to protect your phone. OtterBox Defender Series for Moto X or for OtterBox Defender Series Case for Moto G – Glacier. For a less expensive option, I have the Griffin Reveal for Motorola Moto X. The Griffin Reveal Case fits well and puts a good shell around the back of the phone. (Here is the same case for the Motorola Moto G ) It is just enough to protect from a drop but doesn’t interfere with the glass screen. I have, uh, field tested it, and I can say it has done its job. Note: Be sure and get the right case for your phone–the Moto G and Moto X are slightly different, so for cases you need to double check that you’re getting the right one! – Motorola Skip– Basically these are little circles that you tap your phone on to unlock it. These are fairly convenient but many will question how much easier it is than just unlocking the phone in the usual way. I’d say there are definitely some uses for these. – If you use Google Chrome, be sure to get the Motorola Connect Chrome extension for some added convenience. It basically allows you to see the phone’s status, know when someone is calling and send text messages with your desktop computer. I have been using it for a while and I will say it definitely saves time when I am at my desk and want to send a message. Also, please have a look at my other money saving ideas. (for instance switching your electricity provider, which is a no-brainer way to save more than a few bucks per month–takes about 1/2 hour to do and is virtually no downside.). Moving your phone service to Republican Wireless is an easy move to make. 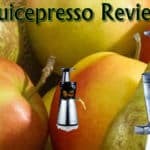 It is commitment free, comes with a 30 day guarantee and is a popular choice in general. Although Republic isn’t perfect, you’ll be hard pressed to come up with similar service at a similar price. If you are not sure if you should jump in, I say give them a try. If you don’t like the phone or the service, you can easily send back the phone and you will have lost very little in the process.